Hi loves! While I was in the US, I tracked down an Icing store nearby our apartment. I was surprised to see they changed their bottles shape to square bottles (instead of round ones similar to China Glaze). The new bottle shape along with some fine color choices made me splurge on a few bottles, and today I want to show you Icing Passionista, a beautiful matte purple shade with a red/pinkish shimmer. Curious to see more (including how it looks with top coat)? Read on for more pictures ^^. Like I said Icing now has square bottles, and they remind me of the Essie bottles! A textured Icing logo on one side, a printed one on the other. The brush cap is rubberized which works really nice, and the brush itself is a flat one with a tapered end (not my personal favorite). Icing Passionista is a medium purple shade and a sticker on the brush cap told me it would dry matte. Because of the heavy shimmer visible in the bottle I wanted to try it, hoping it would give some sort of suede finish like the old OPI's did back in the day. Luckily the formula was really great. A bit thick but still easy to spread and very opaque - the first coat was almost enough! I used a second to even out a bit and make sure I wouldn't have bald patches. It dries fast but not too fast so you can work it a bit to make sure you'll get an even result. While I liked it matte, the shimmer disappeared a bit too much to my taste so I busted out top coat to see what it'd do to this beauty. Well, it looked like it glows from within! The camera didn't capture the true beauty, it's even prettier in person. If you have an Icing nearby, I recommend this shade! Have you ever tried an Icing polish, and if so, which shade would you recommend? And do you like this better matte or shiny? Tell me in the comments! This is insanely gorgeous!!! I love it both ways, but the shimmer really comes to life with top coat <3 hard to resist! I love it when a polish is gorgeous both ways!!! What a gorgeous shade! I'm not familiar with this brand. Your nails are perfect. You could be a hand model! What a stunning shade- what an amazing transformation with the top coat! Oooh! This color is so pretty! That top coat makes such a difference! This is absolutely stunning. I'm usually a matte lover, but this is just phenomenal with a top coat! I haven't tried Icing polishes yet, but I'm tempted now! This is reallllly pretty! I never knew that Icing made such gorgeous colors! That color is amazing! Such a rich, vibrant shade! That's such a pretty, especially when it's glossy. Oh man! This is beautiful! Your swatches do this polish such justice! Either way it looks gorgeous ! This is fabulous, and gorgeous on you! It reminds me of Zoya Savita, maybe with a little less shimmer. Love the matte more than I do the shiny one. This is so pretty in so many ways! That's gorgeous! I've never heard of this brand but I'll have to check it out. Oh wow. I need this one in my life, for sure. LOVE! I totally think these look like the new Zoya matte velvets! Thanks Anne, couldn't agree more! Aww, thank you so much Allison! Thanks Jamie, glad you like it :). They aren't even that expensive, since they ALWAYS have buy 1 get 1 half price. Yes it has the same basecolor I think! Thanks Norah, I'm still undecided ;). It's such a difficult decision! Please do! Not sure if it's available in Canada though. Haha it does sure look unique when matte! It could fit right in! Definitely, and that last picture is INSANELY GORGEOUS! 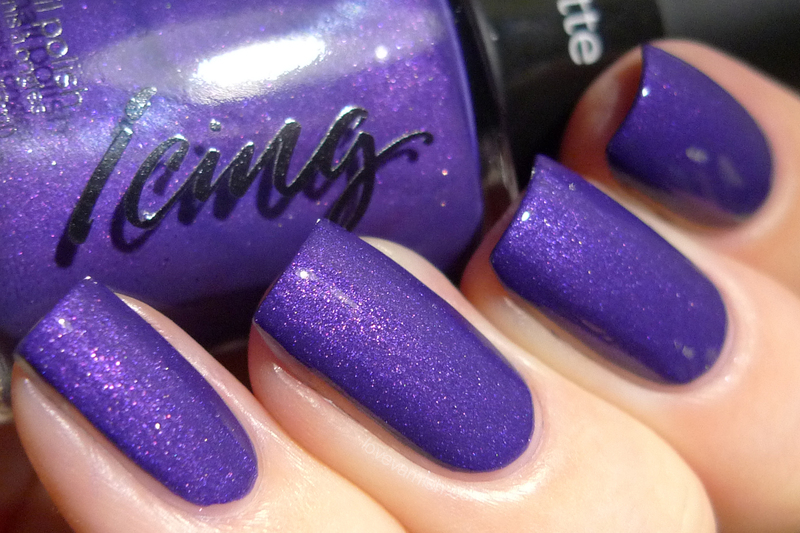 This shade is beautiful on you and I really love it with a top coat!